Gordon Van Gelder, Welcome to the Greenhouse. OR Books, 2011. Pp. 336. ISBN 978-1-935928-27-0. $17.00. There’s a strange detachment to Welcome to the Greenhouse. The book, edited by Gordon Van Gelder, features sixteen original short stories by an impressive roster of writers including Brian Aldiss, Bruce Sterling, Alan Dean Foster, and M.J. Locke. 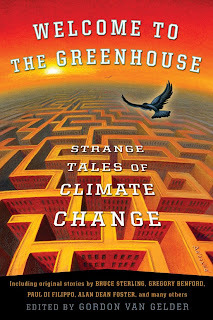 The table of contents is exciting, but even as some authors approach the anthology’s theme of climate change as an urgent and dramatically rich reality, the book as a whole feels surprisingly aloof. Enough of the stories turn on jokey or weirdly irrelevant hypotheticals that the anthology often feels both distant and dated. Neither of these qualities are deal-breakers in themselves, but readers’ mileage may vary even more than usual for a theme anthology of this kind. The strongest stories here, such as Ray Vukcevich’s warm and wry ‘Fish Cakes,’ explore the pathos in adaptation to a changing environment. In Vukcevich’s story, most Americans have retreated to a wired indoor existence in order to escape the scorching world outside, but a young man named Tyler makes a rare cross-country flight to visit an online friend, Ilse, who has lost her grandmother. Vukcevich draws his characters carefully and with great empathy, and the story’s simple notion that our descendents will harbor a sad, resigned “Ancestor Resentment” is quietly affecting. Unfortunately, many of the stories here foreground Big Snazzy Ideas over everything else. Or rather, Ostensibly Snazzy Ideas—few of them really stick in the mind after you turn the last page. 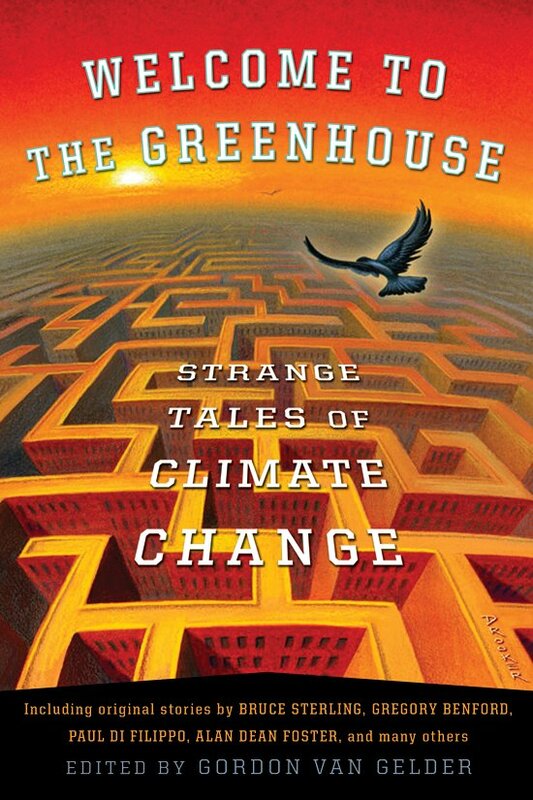 In Michael Alexander’s ‘Come Again Some Other Day,’ scientists discover a way to send undesirable climate patterns elsewhere in time. The concept allows for some insight into the fundamental absurdity of our culture’s responses to environmental crisis, but there’s little else here: the characters are thin vehicles for exposition and plot summary, and the conclusion is a ludicrous wish-fulfillment fantasy. Matthew Hughes’s ‘Not a Problem’ gives us a caricature of an industrialist named Bucky Sansom, whose attempt to recruit alien assistance in the fight against climate change backfires and (spoilers) results in an invasion by intelligent alien dinosaurs. You have to appreciate talking alien dinosaurs, of course, but the story feels like it ought to end with a rim shot, apart from seeming sort of arbitrary to the book’s theme: the precipitating crisis could have just as easily been nuclear standoff, superflu, or economic collapse. Jeff Carlson’s ‘Damned If You Do’ depicts a pseudomessianic superhuman’s efforts to save the world in spite of the world’s assorted efforts to stop him, all told through the eyes of his father. The story is told almost entirely in exposition, which is especially problematic because the father’s voice too often skews toward the artificially folksy (he explains that “hydro-whats-it” engines are cleaner than oil engines). Refreshingly, ‘Damned If You Do’ gives us a messiah without allowing any easy answers, but that seems to be the only thing we carry away—it’s hard out there for a superman. Other stories fare better without really standing out. Though barely related to the anthology’s theme, Bruce Sterling’s ‘The Master of the Aviary’ sketches an intriguing post-collapse society modeled after ancient Greek city-states, where self-styled philosophers like the protagonist, Mellow Julian, go about their Socratic business, educating aristocratic young men and coming into occasional tension with the state. The story ambles along without much direction, but the sights are well-realized enough that we’re content to follow along—it’s like a trip to the museum, pleasant enough if a bit staid. ‘True North’ by M.J. Locke offers a pretty standard post-apocalyptic quest enlivened by crisp prose and careful pacing. Alan Dean Foster’s ‘That Creeping Sensation’ is a mindless but fun videogame of a story about bugs grown giant (due to rising oxygen levels) and the folks who kill them. Paul Di Filippo delivers a fantastic premise in ‘FarmEarth’: a global environmental reclamation effort modeled after a massively multiplayer online game. It’s a big idea done right, optimistic and often fun, but hamstrung by constant wince-inducing neologisms, as well as frequent over-explanation. If you don’t flinch at lines like “even though I was reluctant to grebnard out, I activated the artificial setae,” then you’re likely to love this story; much like the anthology as a whole, I found myself wishing I liked it more. It’s probably unfair to compare Welcome to the Greenhouse to an ideal, imaginary anthology, but I think it bears saying: Paolo Bacigalupi’s stories or Carrie Vaughn’s recently Nebula-nominated ‘Amaryllis’ would feel strangely out of place here. I wouldn’t want an anthology full of apocalypse, but there’s a visceral quality to the speculative extrapolation in those stories, a careful and meaningful extrapolation from this moment in time, and that quality feels largely absent from Welcome to the Greenhouse. “Dated” may be the wrong word for this book, because it’s not necessarily of the past: it simply feels not-contemporary. Well-intentioned, but not-of-this-moment. There are some fine stories here—the Vukcevich in particular is well worth seeking out—but few of them feel urgent.